One of the most frequent questions I’m asked at the workshops that I lead is “What’s your process?” Here are a few of my answers. Nature is my starting point. I live in an urban area, so I’m glad to spend any time I can getting away from the crowds to simplify and slow down. When I’m in my studio, I revisit nature in my mind as I paint. What emerges are paintings that are my interpretation of the landscape and nature. The artwork doesn’t reflect a specific scene. Rather, it’s an invented landscape that’s a distillation of my memories of walks and travels. As a result, by design, I want each person to see my paintings with their own ideas of place and emotion. While some paintings include representational elements I see in a landscape, I aim to hint at a shape or color. To do that, I challenge myself to filter and simplify what I see and paint, to push objects and color to abstraction. I create my artwork using oil paint, dry pigments, charcoal, sand, marble dust, and mediums such as Cold Wax, Galkyd, Galkyd Gel, and Neo Megilp. I create these paintings slowly adding texture as paint is applied, wiped away, scraped, and scratched. My paintings contain many layers, switching between transparent and opaque pigments, and cool and warm colors to provide visual interest. By using various mediums and additives, I’m able to introduce uniqueness to the surface. I use brushes and other tools to apply, scrape, wipe and remove layers of paint. Because texture and abstraction are each a focus of my work, I'm constantly experimenting with tools and techniques to achieve interesting surfaces. Whatever tool I’m using, I scrape and scratch into each paint layer creating texture as I "build" each painting. I apply paint with conventional brushes and painting knives. The brushes I use are low-grade chip brushes from hardware stores. Whether a brush is new or worn down, each brings a distinct textural quality to the surface. Painting knives of various sizes and shapes allow me to apply paint and scrape layers. 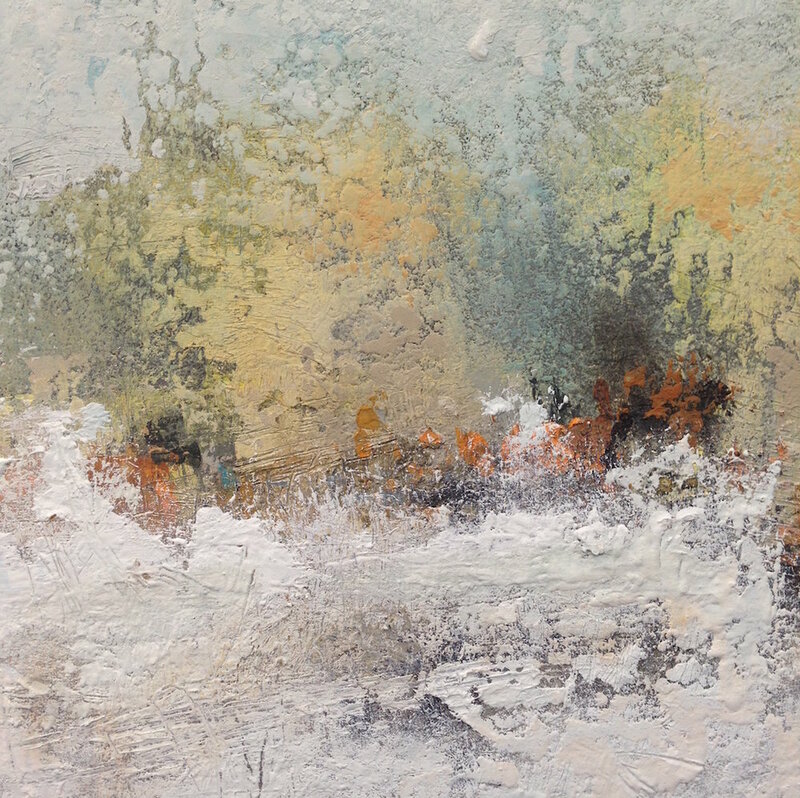 The painting knives are great tools for abstract rendering and avoid the expected detail of brushwork. I also use unconventional tools and techniques to apply and remove paint layers: pot scrapers, scrub brushes, wire brushes, whisk brooms, putty knives, bamboo skewers, brayers and even my fingers. I paint on Baltic birch panels, stretched linen, linen glued to panels, and Arches acid-free oil paper. I coat panels with oil-based ground or acrylic gesso and prime linen with oil-based ground. I like to use panels because they allow scraping, scratching, and vigorous rubbing of the surface with no damage to the support. Stretched linen is good for large paintings when size and weight are concerns. I do use many of the same tools and techniques as when painting on panels, but care must be taken to not scrape too much and rip into the linen. Hasn’t happened yet! Paper provides portability and has a great surface texture. The paints and mediums soak into the surface a bit more which creates a softer, more subtle effect which works well with my approach. This is just a beginning of my answer about the way that I use materials, tools and techniques. I share more about this in my workshops. If you’re interested in learning more, contact me and we can discuss a workshop or mentoring to help you learn, explore and create.